Whether it’s Elon Musk’s bold promises about colonising space or the proliferation of great-looking sci-fi movies that are about exploring the stars, we’re all collectively more interested in space at the moment than ever before. So it’s no surprise that everyone, from beginners with a spare 20 quid through to serious astronomers with big budgets and high expectations, are keen to get their hands on the best stargazing telescopes so they can see more of the universe with their own eyes. There are plenty of budget-friendly scopes on the market, which is great news for beginners with commitment issues. But if you’re looking for a hyper-detailed journey to the very edges of the Milky Way and can only just about make out the Clavius crater on the Moon’s surface, you’re likely to be sorely disappointed. This mean you need to make sure your expectations are aligned with the telescope you’ve set your sights on. But from aperture and focal length, through to portability and price design, there’s a hell of a lot to consider. For example, did you know there are actually three different types of telescope? 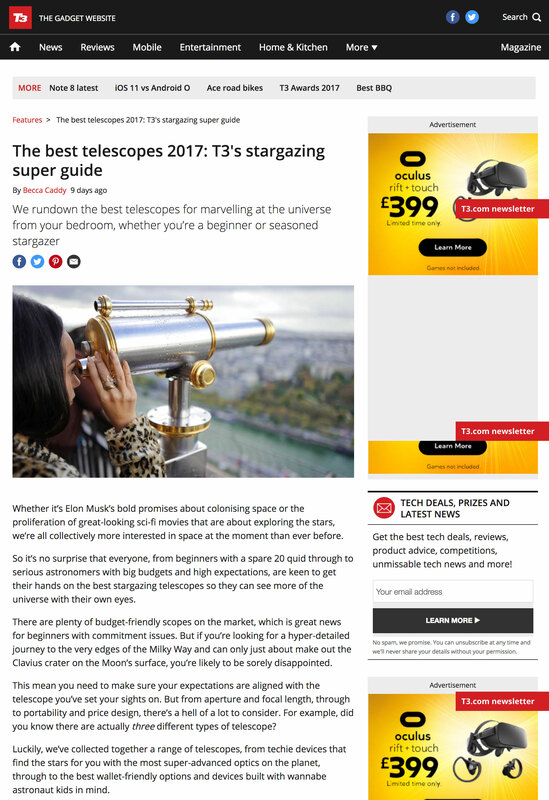 Luckily, we’ve collected together a range of telescopes, from techie devices that find the stars for you with the most super-advanced optics on the planet, through to the best wallet-friendly options and devices built with wannabe astronaut kids in mind.